“Josephine Shaw: Complex, yet singleminded. A tiny woman with big ideas and, some would say, a mouth to match. But what does she really know about sustainable living as it relates to the real world? After all, she and her two friends are new to farming. Raspberries and Vinegar is a great book that shows the relationship between Jo and Zach. The story starts with Jo and her two friends, Claire and Sierra, moving into a trailer temporarily while waiting for their communal house to be built. The land that they have purchased once belonged to Zach’s grandmother which explains how he happens on their doorstep that first day…just as Jo’s throwing out a rat’s nest! The girls do run into their share of problems and while Zach is reluctantly there to help, he’s greatly disappointed to learn that more often than not they don’t need his help. However, the girls aren’t the only ones that need help. Zach has just finished not only receiving his degree in Veterinary Medicine but a relationship with his bosses daughter that ended in the losing of his job. While this does work out to Zach’s benefit, due to his father being sick, this lands him in the perfect position to stick around the homestead for a longer amount of time…something Zach is not keen on. What follows is a story of two people overcoming, what they think are drastic, differences to realize that building a life together is what’s best for both of them. I loved Raspberries and Vinegar for the most part. All of the characters were pretty well fleshed out and the story flowed really well. I will say that I was hoping that when one of the characters died that it would somehow wind up being Zach’s ex that died in the accident, as she was making trouble for him at the time. When that didn’t happen it just showed how true the book was because in real life the good guys aren’t always spared and the bad guys do sometimes get away with things. My ONE complaint with the book is that the girls do come off as very overbearing and pushy with their lifestyle and because of that it actually took me awhile to warm-up to liking Jo. Honestly, I disliked her for about 3/4ths of the book which isn’t a great thing when she’s the main character. This sounds like a really great read! 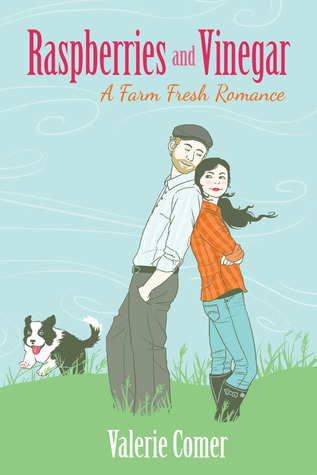 I love the little “farm fresh” romance connotation LOL! I need a new book to read. Sounds like this one is right up my alley. Thanks for the review. I used to read all day long but as an adult pretty much stopped. Although I am so in love with Orange is the Next Black that I bought that book! This boon sounds quirky and humorous – in other words right up my alley. Thanks for the recommendation! I was curious about the book based on the name. Your review increased my interest. Sounds like a great book! I love finding new reads that sound good and wll be putting this one on my Goodreads list. I enjoyed the book too…sometimes I felt that the flow of the writer’s words was a bit too punchy…like I wanted her to make some of her sentence transitions to be smoother…and I did think Jo was pushy, but other than that, I enjoyed it. 🙂 Thanks for reviewing it! Thinking about it I can see the sentence transition issue but I didn’t notice it as much as I did how unlikeable I found Jo lol.